News Analysis Versus Opinion, What's the Difference? Is There a Difference Between News Analysis and Opinion? Journalism students are taught never to include their personal opinion and to just stick to the facts in their stories. However, analysis is often part of news stories. Make sure you know the difference between analysis and news opinion before you tinker with either in your news reports. "I hope Donald Trump is President." "My favorite NFL team is the New York Jets." "The best TV show is The Big Bang Theory." Those are examples of a personal opinion that have no place in the news. Those statements don't have value to a news story and can indicate bias in reporting if you are covering a presidential campaign or the Jets game against their archrival New York Giants. At the very least, the audience will think "who cares?" when hearing your preferences. A TV news anchor who adlibs personal glee that the weekend will be sunny and warm might set herself up for trouble. That's because the area's farmers who haven't had rain in weeks are in desperate need of wet weather, even if it's on the weekend. They don't want to hear an empty-headed anchor's happiness over dry conditions. What makes someone's personal statements more than just opinion is their expertise in a subject. A news reporter who has covered presidential elections for 30 years will be seen as having knowledge about the subject and not be someone who's just out chasing politicians around the country. So when that reporter points out that a candidate who is from New England needs to do well in the New Hampshire Primary because he's from the region and will likely face a struggle in the upcoming South Carolina Primary because he's not from that area, there's some credibility to back up what's being said. A reporter including that analysis has not included personal opinion. The reporter is saying that if the candidate doesn't do well in his home base, he's going to face an uphill battle when the campaign goes elsewhere. That is a believable statement to make. Above all, news analysis should have a reason for being part of the story. That depends on whether the analysis has value and meaning for the audience. Think of the usual two-person team announcing a sports event on TV. The play-by-play announcer sticks to the facts. In a football game, that announcer says whether it's 4th down and 20 yards from a team's 40-yard line and so forth. The other person provides analysis, saying that the quarterback is under pressure because his throwing arm has been hurt and he's facing a constant defensive blitz. That analysis helps the viewers at home understand what is happening on the field. A football game with nothing but play-by-play wouldn't be very exciting to watch. In news reporting, there isn't usually an opportunity to have two people teaming up to present a story. 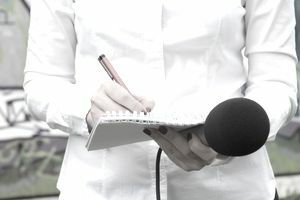 A news reporter who is trying to straddle the line between reporting the facts and interpreting them should rely on a TV news producer or TV news director to look over scripts to make sure the balance is maintained.